Twelve years ago the hyperactive manager and director of Divadlo pod Palmovkou arrived on the Libeň scene. He turned a theater that drew marginal audiences into a sought-after stage that is always sold out. What’s the secret of his managerial skills? A theater in which the cast sometimes outnumbered the audience around 1990 is now sold out long in advance. How did you do it? At the time I came to Palmovka from my engagement at the E. F. Burian Theater, rumors were rife that both these theaters were on the way out. The audiences numbered in the low dozens, and when I named Hamlet as our first play, half the cast quit. They didn’t believe in me, and they didn’t believe in the project, and they ran away. Paradoxically, this turned out to be an advantage, because the cast purged itself. I had the unique chance to choose the direction the theater was to take. I decided that we would put on great human stories, first-rate plays. But our return to classic drama was also exceedingly difficult – we had to put up with harsh critics, who reproached us for not being modern or avant-garde. But for me the most important thing was to stage a high quality repertoire to sell-out audiences. A good team is the engine that drives any activity. Were you able to bring a good cast together? I think so, although it was very difficult. I spent five years building our repertoire and struggling to convince the actors to take a chance and join us. Fortunately, we managed to attract some good people, such as Jirka Langmajer, Rosťa Čtvrtlík, Jitka Sedláčková, Vilma Cibulková, and many others. However, some of the founding members of the theater, who were nearly eighty years old, stayed. But I wouldn’t characterize the theater as a team, it’s more like a big family, and I didn’t want to limit the theater to a single generation. I simply adore actors, and I see the cast as the main pillar of the theater. Is it better if the cast all pull together and a friendly atmosphere permeates the theater, or do you think competition is better? I don’t know if it’s possible to be friends in the theater, but I think we behave amicably towards each other. I don’t like competitive, confrontational, stressful environments. I understand that when the director “needles” an actor it can lead him to perform magnificently. But that’s not my style. A confrontational environment brings dirty tricks and slander, and they have no place on the stage. Time usually shows who has what it takes for the lead role, who attracts audiences. Some could be disappointed. And that’s the most difficult thing about running a theater – dealing with such expectations and disappointments. But you bring in guest actors for some performances, theatrical stars who receive higher pay and have more freedom on the stage than the regulars. Wouldn’t you say that this probably doesn’t do much for the cast’s mood? It’s tough. The audience is to blame, as they simply want those actors. I think carefully about whether it’s possible to use one of our own actors for a role, but sometimes no one fits the part. If I think the best Cyrano in Prague is Boris Rösner, I put him in that role. Of course I’m aware that this can create bad blood, but the main criterion for me is success and a sell-out. The director always plays the main role. How would you describe your approach as a director? Do you insist strictly on your vision, or do you give the actors space to improvise? I talk it over with the cast before we put on the play. I ask them for their opinions, and we never begin rehearsals unless we’re sure it’s worth the effort. Sometimes the stimulus comes from an actor. I ask him or her, “Would you really want to play this role?” If he or she convinces me, then we get on with it. These are the more liberated characteristics of our theater – the actors can come forward and tell us about their dreams. When rehearsals start we adhere completely to the script. Do you ever have self-doubts? Always. This time I’m dead serious – Cyrano will be the last play I direct. For me a second of directing is like a year of managing. I feel a tremendous responsibility, and managing the theater and directing a play places me under great tension. You seem much more like a bohemian than a manager. Wouldn’t you be bored if all you did was manage? It’s a fact that I’m not a typical manager. I don’t have an office, I run around the theater in a T-shirt instead of a coat and tie, and when I need to speak with someone I go looking for him or her. This goes with my impulsive nature. I can’t stand paper-work, I lose it, so my subordinates don’t even bother giving me any documents. But I’m good with numbers, and economics don’t give me any problems. 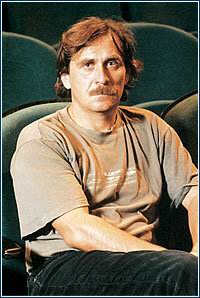 1991-present director of Divadlo pod Palmovkou, becomes manager in 1992. Directed Of Mice and Men (1992 premiere), The Idiot (1993), Cat on a Hot Tin Roof (2001), The Wretched Killer (2002), etc. You have already demonstrated good management skills, and some members of your ensemble rate you as an excellent manager who lives for the theater. Do you have any weaknesses? Of course, lots of them. Some people reproach me for avoiding publicity. I don’t try to increase my visibility, I don’t go to any parties or any other theaters. I’d rather do things myself, and that’s a classic mistake for a manager. I’m always changing things around, and I don’t do anything according to templates. I don’t have any secretaries, and I make the coffee for everyone. A classic manager would be shocked by me. I just feel free in my T-shirts and corduroys. If I couldn’t be myself I’d quit. As informal relationships are somewhat the rule in theater, is it hard to earn authority? There’s a classic saying: “Some people are born great, and some people have to earn greatness”. It isn’t easy to assert authority, you have to be able to convince people. If you scream at people you won’t get anywhere, because they’ll feel like slaves. I think that sometimes it’s better if they feel a bit of contempt – you can get better results. Do you go through stressful situations in the theater? There’s always stress before a premiere. The stakes are high – it’s about success and results. Sometimes a play develops with difficulty, and complications can suddenly arise – someone might get sick. For me the most stressful part is probably when rehearsals begin, and the responsibility grows with each new play. I’m already looking forward to getting it over with, to turning it over to someone else. I have to relax a little, and, most importantly, the cast needs a rest from me. Eventually, they’ll take it over for me (laughs).